I have to admit, I was a little embarrassed when I first checked out this book from the library. With the cover being vivid forest green along with large white lettering that read terms such as Molecular Mass, Particle, Gamma Ray, and Joule, I was grateful that my local library enables self checkout so nobody could see I was taking home what appeared to be an elementary physics book. To my horror, the book sensors at the entrance went off as I went past and for a moment I thought that they were going to tell me that I couldn’t check out this book as it was reserved for a class of children. Fortunately, I managed to smile and give a half wave to the librarian, who was helping another customer at the time, and scurried on out of there. I wasn’t particularly a fan of physics when I was in high school (although, to be fair, I wasn’t much of fan of anything at all during those dreaded days), but I’ve been watching a lot of The Big Bang Theory recently, so wanted to brush up on my general knowledge of the subject. I was initially a bit thrown off by the cover and title, but as I started reading, I found that I enjoyed re-learning the material and thought it to be a good refresher. The first two thirds of the book are pretty standard and cover basic explanations of things like forces, gravity, energy, electricity, etc. It did get a bit slow near the end of this section and I remember getting easily sidetracked. However, the last three chapters on relativity, quantum physics, and the universe were quite engaging. 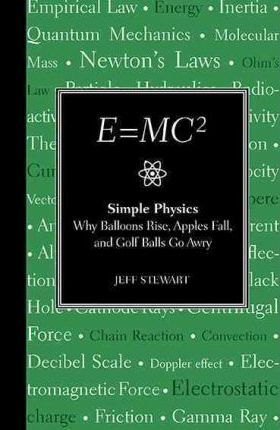 I think Stewart did a good job of explaining things in terms understood by non-physicists. The text was easy to read and although he uses a variety of corny examples, I feel I now have a better overview of the field of study. Now that I am out of school and have a greater appreciation of knowledge and education, I thought this book was not only interesting, but found myself wanting to know more. I would recommend this book to anyone looking to learn a bit more about fundamental physics, but would skip the chapters that you already feel like you have an understanding of. I noticed that the last page of this book promotes other informational books (by the same company) on things like grammar, math, and languages. I would not be opposed to picking one up if I was interested in the subject.